In 1940s and ‘50s, my neighbor Antoinette Rich told me stories of her being a very prominent pianist in Chicago. She would show photos of her posing with a conductor baton leading a 12-piano symphony orchestra. While it’s not exactly a question, we’re glad our viewer wrote to us about Antoinette Rich. She was a fascinating woman. In Rich’s orchestra, not only were there more than twice as many pianos, all the musicians were young women from ages 18-30. Rich claimed it was the only all-woman organization of its kind in the world. She had soloists on two grand pianos, three more soloists at three upright pianos, and two girls each at seven more upright pianos. On stage, the pianos were on tiered risers with Rich conducting at the top, and they were arranged so that the pianists’ hands were visible to the audience. All of the women wore long white gowns, and lighting effects were used to color various musical selections. Rich and her piano orchestra performed frequently at Orchestra Hall throughout the 1940s, including a performance with a chorus and harp in a concert celebrating the Baha’i faith – that’s a reproduction of the Baha’i Temple in Wilmette in the background (below). They also traveled to perform in festivals. “Antoinette Rich” was actually a stage name – she was born as Ruth Schreiber on the city’s West Side, where she also lived when she knew our viewer Lionel. She became interested in piano symphonies during three years in Philadelphia working as an actress and model. 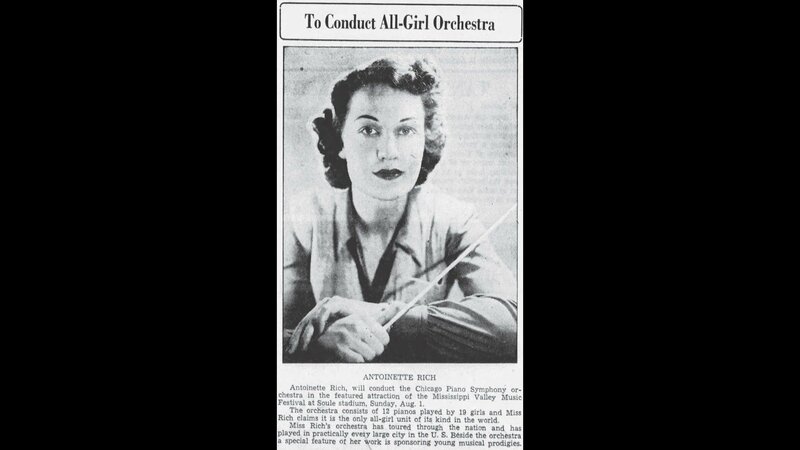 While she was there she helped Australian pianist Carle Knisley to organize a piano symphony orchestra that was not exclusively female. Interestingly, Knisley later formed his own all-women piano symphony which he also claimed was the only one in the world. But that’s where we lose the thread on Rich – we couldn’t find anything on her or the Piano Symphony Orchestra after 1949. Our viewer mentioned that she divorced and moved to the Las Vegas area, but we could find no evidence of her starting a similar enterprise there. If anyone reading this happens to know what became of Antoinette Rich, please drop us a line! We’d love to hear about it. From the Green Line I can see a very large, beautiful Town Hall for Austin. It looks like a building of a prosperous town. What can you tell us about Austin before it was annexed to Chicago and about its town hall? Before Austin was a Chicago neighborhood, it was indeed a prosperous town, but the building labeled “town hall” was built after Austin was annexed to Chicago and never actually served as a town hall. Austin was originally developed, and modestly named, in 1865 by Henry Austin, who was a civic leader in nearby Oak Park. He was such a fanatic about temperance that when Oak Park was voted dry, he supposedly bought the last tavern in town and threw the liquor into the streets. He envisioned Austin, originally named Austinville, as a temperance settlement with gracious homes and landscaped parks. Austin became the seat of Cicero Township and a township hall was built in 1870 on the site of the building our viewer is asking about. The town got into a fierce rivalry with Oak Park over extending the Lake Street “L.” Austin wanted it, Oak Park didn’t. But since Austin was the largest community in the township it used its clout to win the battle. Oak Park and other Cicero Township communities got their revenge in 1899, when they voted Austin out of the township entirely, annexing it to Chicago. By 1920, Austin was a thriving neighborhood of upwardly mobile immigrants from Germany, Scandinavia, Ireland and Italy. The old Austin town hall was torn down in 1929 and replaced by the building our viewer noticed. It’s actually a park district field house. The name Austin Town Hall on the building refers to the park that surrounds it, which is called Austin Town Hall Park – a reminder of the days before annexation. Yes, it does look like Philadelphia’s Independence Hall. The architects Michaelsen and Rognstad were inspired by that colonial building. The same firm also designed Garfield Park’s Golden Dome field house and the On Leong Tong building, now Pui Tak Center, in Chinatown. As Austin drew more people, many Victorian frame homes were replaced with brick two flats, courtyard apartment buildings and bungalows, but some of the gracious old housing stock remains in the Austin Historic District. Note: This episode of Ask Geoffrey first aired on “Chicago Tonight” on Feb. 21, 2018.